A Quiet Place is a new horror movie directed and co-written by John Krasinski, who co-stars alongside Emily Blunt, his real-life wife. They’re a couple that you can’t help but love, and they totally seem like the type that you’d love to be friends with, too. So you’d think that a movie starring Blunt and Krasinski would be totally sweet and adorable, right? Don’t get us wrong, A Quiet Place looks utterly ah-mazing, but seeing as it’s a horror film, it’s less sweet and adorable, and more chills and thrills. And initial reviews have started pouring in, and they’re largely positive. In fact, the movie is certified fresh on Rotten Tomatoes. So while it would be really fun to see a rom-com that had the two of them as a couple or falling in love, we’re really excited to see them, you know, fighting to save themselves from sound-sensitive beings. 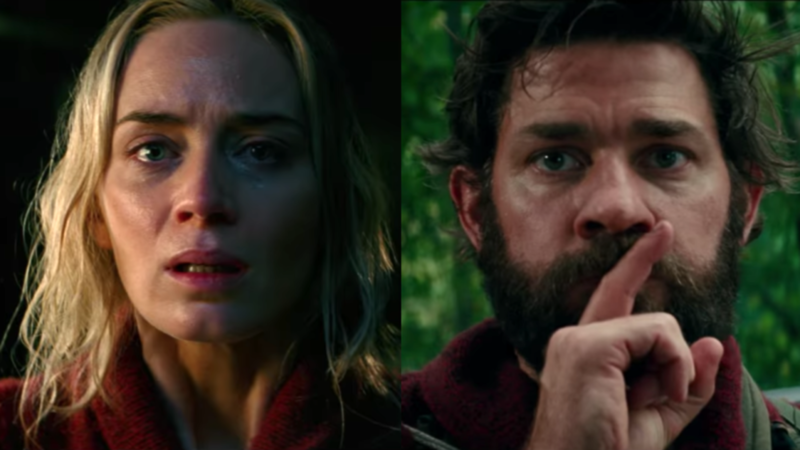 And we’re all the more excited as Paramount has released the final A Quiet Place trailer. It gives us a bit more backstory into the world Krasinski and Blunt’s characters, Lee and Evelyn, find themselves in; namely, a global invasion from a seemingly alien force has decimated the planet, and those remaining after the attack are left living in hiding. Lee and Evelyn work to find a way to live as silently as possible to remain unnoticed by the monsters eradicating humans, protecting their children and giving them the best life possible under the circumstances. It’s not clear how long after the initial invasion the film takes place, or if Krasinski and Blunt’s characters have any memory of life before they lived on the run, but that makes things all the more intriguing. So, needless to say, we’re so excited to jump into this terrifying story, and it’s even more fun to get to go on this thrill ride with one of our favorite celeb couples. A Quiet Place arrives tip-toes into theaters on April 6th, so get ready to get quiet!